We make it easy for you to put your company name, logo or message on almost anything. 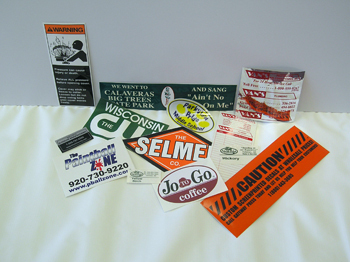 We can create a variety of labels, decals or bumper stickers in various shapes and sizes - from just a few, to thousands. Whether its for property identification, point-of-purchase displays, packaging, advertising or even for company vehicles, we have the abiltity to fulfill all your communication needs. Contact one of our representatives to find out more about how labels and decals can help identify, protect and promote your business.